Robert Dover is coming to town! This coming weekend (October 15 & 16), Robert Dover will be giving a clinic at Wyngate Equestrian in Walworth, Wisconsin. Wyngate is where I board Jag, and I am auditing both days. I’m especially excited about Sunday, because Christy is riding in the clinic that day. This will be my first big time dressage clinic. I’ve seen a couple with local trainers, and they were informative. And the George Morris clinic I audited last year was incredible – I learned a lot even though the focus (upper level jumpers) is not in the least bit germane to my riding and my goals. Robert Dover represented the US in the Olympics six times, and in the World Cup seven times. He’s also reputed to be an excellent clinician and teacher, and is probably the preeminent coach in North America. This is simply an amazing, amazing opportunity. And yes, I’ll be taking copious notes, which will end up right here. 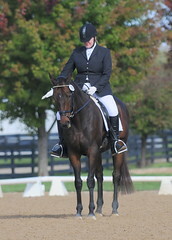 Photo courtesy of Wyngate Equestrian and Robert Dover.